In Stockholm our Saturdays tend to follow a pattern. Design district for The Gentleman, a couple of vintage shops for me and lunch invariably at Östermalm Market Hall. Most likely at Lisa's. This restaurant at the heart of the hall specializes in fish and seafood and is always packed, though well worth the wait. Toast Skagen, so loved by the Swedes is one of the menu favourites and for a reason. And the perfect accompaniment for this classic is aquavit which there are many varieties of. 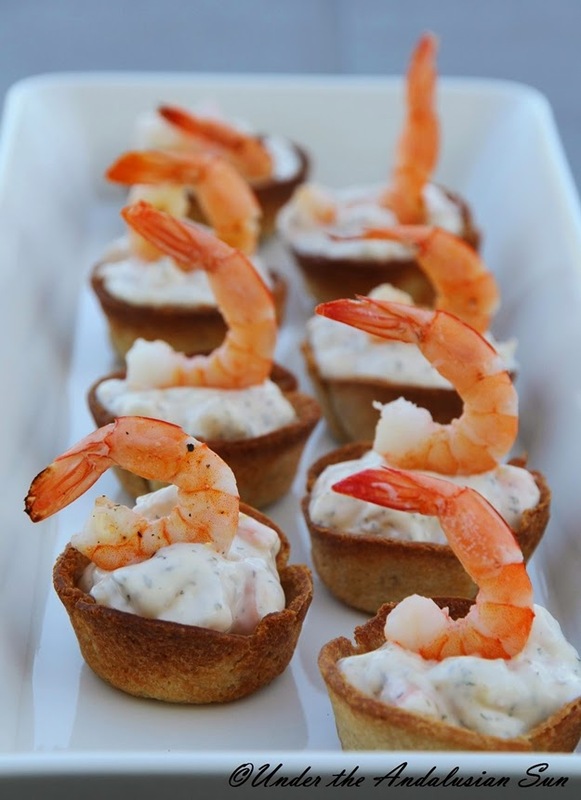 Today Toast Skagens were fashioned into mini versions suitable for appetizers or canapés to go with drinks. The bread baskets are the same we made for the tea party. These king prawns weren't as masisve as the ones we've used in the past. You can use any size prawns for this of course - depending on the size you'll need 24-32 of them. Some of the mayo ( 1/3 or 1/2) could be substituted with Turkish yoghurt, too. Prepare the bread baskets according to the instructions here. Let them cool. If using uncooked prawns, shell and de-vein them (leave the tail on for 8 prawns you'll need for decorating). Brush lightly with oil, sprinkle wiith some lemon juice and a little bit of chilli. Season and cook - either in a pan, on the grill or in the oven (175°) for a couple of minutes until done. Let cool. Chop the cooled prawns into chunks (remember to save those 8!) and mix with the rest of the ingredients. Spoon into the baskets and serve!